Lentz & Company offers vintage home goods, furniture and local art - with a strong nod towards the 60s and carefully curated kitsch. Come discover a treasure today! Lentz & Company is a cozy shoppe nestled in the heart of Clifton's Gaslight business district in Cincinnati, Ohio. 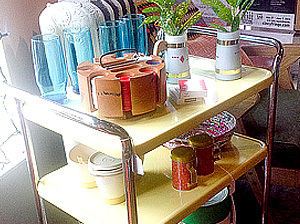 We feature vintage home goods, furniture and local art. Gems from yesteryear make our place a treasure hunt every time you enter. You'll find retro kitchenware and bar accessories, chic to cheap vintage furniture, as well as a carefully curated collection of kitsch. Want something that looks like it came off the set of Mad Men or a funky necklace that didn't come from a big-box store? Then make Lentz & Company your next destination. You never know what one-of-a-kind item you'll discover today.